This month sees me back in Uganda again …. for about the 15th time in the past 8 years! Some people go to Spain year after year – so I guess I am not really that different! But seeing the work being done here and how it is benefitting the local community is so much more satisfying to me than simply sitting on a beach in the sun would be. What is going on here in Ruhanga right now? Well, as usual Denis has several projects on the go at once – I have learned to expect surprises each time I come. Hot showers are the latest upgrade to the volunteer accommodation. Electricians, plumbers and carpenters have all been busy at Uganda Lodge. 18 volunteer rooms means that couples and others who prefer their own space can generally have a room for themselves and at £70 per week with all your food provided that is pretty good value. Most volunteers work very hard both before they come by doing fund-raising and then again with the children once they are here. Others come mainly for a rest and to have some fun and days out exploring the local area, but that too is OK by us; everyone helps in their own way. To get out here to Uganda don’t forget to try Diversity or Key Travel for Charity flights – you can reserve a seat now and not pay anything until the week before you fly. Their flexability means you can also change your return date very easily. The ten new children who started Ruhanga Development School this term are now up on the website at http://www.sponsorachild.co.uk/category/children-needing-sponsors and along with 60 others who joined earlier in the year are looking for kind people to sponsor them. 90 pence a week – thats all it costs to give a child a good education and help him or her to have a brighter future. Please can you, or one or two of your friends, take on a couple of these children? It takes two minutes to set up a monthly Standing Order from your bank account and you can either download an application form from the website with our bank details or email me and I will send one as an attachment. 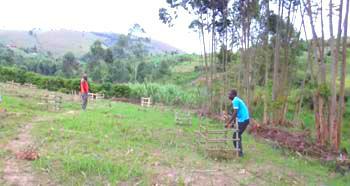 Many of you reading this have actually been out to Ruhanga and have seen for yourselves what £3.50 a month can achieve. Please, Please – do it now – choose a child and set up a standing order today. Thanks to Alan’s oven and Robin, Clare and Holly’s catering skills we have recently had fresh bread, cakes and a large pizza and I was hoping to lose weight while I was here! The demonstration vegetable garden that Ibrahim and volunteers organised is taking shape and the seedlings are showing.through. A larger plot of land on the hill behind the Lodge has been identified as a school vegetable patch and teachers and older students alike will be working hard to get that going. It has been started off by a couple of volunteers purchasing 100 orange trees to provide extra vitamin C for the children. At the school the kitchen is now fully functional for cooking both the breakfast porridge and school lunches. New larger metal window frames are being fitted in the two baby classrooms giving them more light and a better class environment. We put glass in a couple of windows but during the first day a football broke one pane – and unbelievably the culprit was a boy named Beckham! The Staff Room and Headmasters Office is completed and was painted by volunteers. A culvert is being dug & cemented to run off exess water from the front of the classrooms. P5 classroom is not yet completed although it should be ready for the start of new school year in January. We took delivery of a very large consignment of childrens educational books from USA plus a variety of school uniform & donated clothing – thanks to the generosity of free shipment via UPS. The books are now easily accessible on new shelves in the Headmaster’s office to staff and children alike. Several volunteers flying to Entebbe from Heathrow have been able to bring out many of the things that have been donated to us in the UK over the past months – especially school uniforms, toys, dress-up clothes and stationery and craft materials. The main activity amongst Natamba and his team of local builders at the moment is the building of a “Healthy Clinic” as Denis calls it – which is being constructed just across the road from the school, with funding from ASE Consulting Ltd.
A huge septic tank has been completed which will service both the toilets at the clinic plus a set of public toilets that we will construct and charge passing motorists to use. 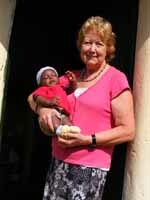 Together with a planned coffee shop this will bring in an income that will help to fund the ongoing running costs of the Clinic. We are currently preparing proposals and quotations for building the toilets, the coffee shop and also some market stalls which village people can rent to sell their crafts and produce. 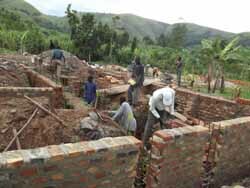 The clinic itself is to be about 7 metres x 14 metres and the foundations are nearly completed. It’s a massive undertaking and trenches have been dug to a depth of almost 2 metres and refilled with bricks, stones and concrete reinforced with metal bars. I know that Denis’ plan is that one day there will be a second floor, so he has allowed for that in the foundations. We should be ready to begin building the walls at the end of this coming week. A few weeks ago Denis learned that thanks to a deceased relative he is the new owner of a large chunk of land (about 50 acres in total) having a frontage on Lake George and lying alongside the boundaries of Queen Elizabeth National Park. Although a big tour company was looking to buy it, in the short term Denis has decided he would like to set up a camping and picnic site. Later, if he finds an investor that he can work in partnership with, he would build a Lodge and also start some Community Projects in the adjacent fishing village – similar to what we have in Ruhanga. Next year our volunteers may have an opportunity to take a break in a lakeside setting and volunteer at the Kashenyi village school. Volunteers who choose to go on safari with Denis will soon be able to camp at the lakeside, alongside viewing the many animals and birds in the park and enjoying a dip in the Hot Springs on the way home. We are still waiting to hear if we have been acepted as a Charity in the UK. Meanwhile I urgently need help from anyone who has skills in using WordPress and is willing to assist with updating parts of our website http://www.ruhanga.com , experience with using mailchimp to send out a more regular newsletter and general administration work in the UK such as taking over the roles of Child Sponsorship, Volunteer Co-ordination, Marketing and Grant applications. That’s it from me today but please feel free to contact me with any questions or offers of help.